ALTRIA AGDC University Animated Logo Transformation from Deven James Langston on Vimeo. This logo animation was created to show the design link between Altria and the AGDC University logo. 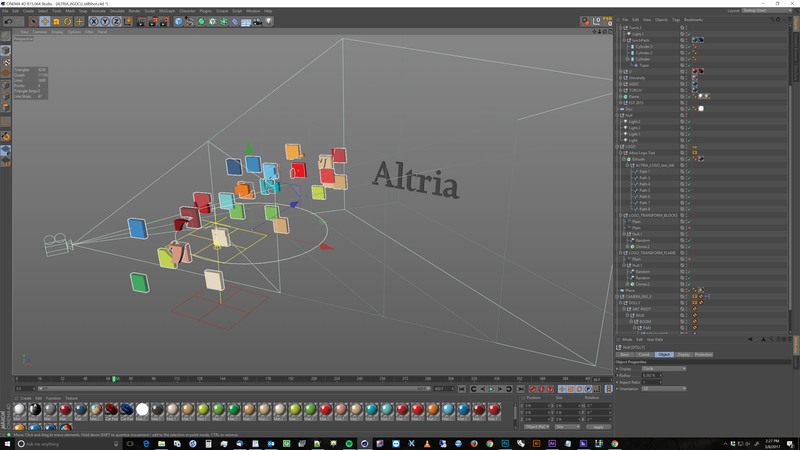 The client wanted to show that the color blocks in the Altria logo are the same ones used in the flame of the University logo, with the idea that one logo would transform into the other one. I tried a few different approaches to the animation before reaching the final you see here. One idea started with the blocks exploding and reassembling as the flame, another used a bright flash and the flame shape cutting away from the square. I wanted the feeling of separation and movement through space though, and finally landed on the idea of a cinematic movie opening inspired in part by the falling film strips in the New Line Cinema logo. Though the movement appears quite simple, the setup was actually a little tricky to pull off. For one thing, the blocks of color are squared off in the Altria logo, while the university logo has them turned diagonally. In addition, the final shape of the blocks had to be cut out in the shape of the flame. I ended up using two different sets of blocks, and reverse-engineered their movement to have them move toward/away from each other along the same basic path. The first set scales down and disappears while the second set scales up to form the final shape. There are only a few blocks with trajectories that meet seamlessly, but it was just enough to make the whole piece appear to transition from the first set of blocks to the second set in the flame shape. The block transform was achieved by putting the entire set of blocks into a cloner object, and using a plane effector to adjust the position, scale, and rotation of the blocks. 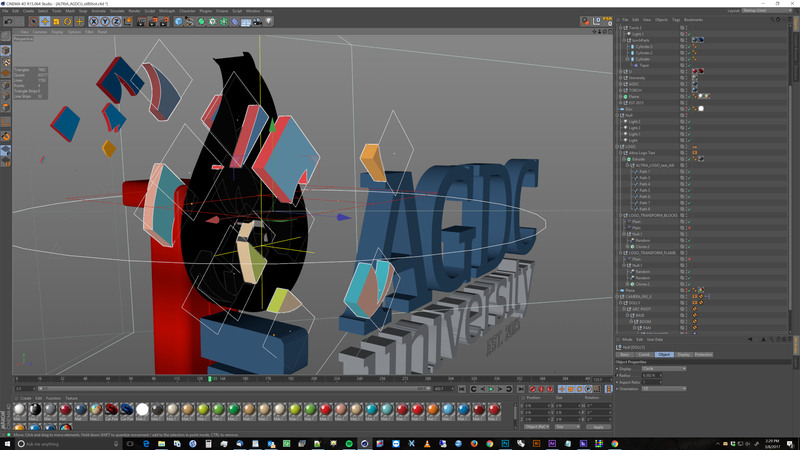 I used a random cloner only on the z axis to add a bit of spacial separation during the move. Once I wrapped my brain around it, the execution was a breeze.